Van Gogh is Bipolar, Are You? When somebody says to you, “I’m bipolar,” what would you say? I was taken aback the first time I heard it because I thought being bipolar meant the person likes both sexes. But I was mistaken. Bipolar, apparently, is a description of a person who has a Manic Depressive Illness — someone who feels very happy at one moment and then suddenly becomes depressed. Jetro, the owner of the resto, is bipolar. 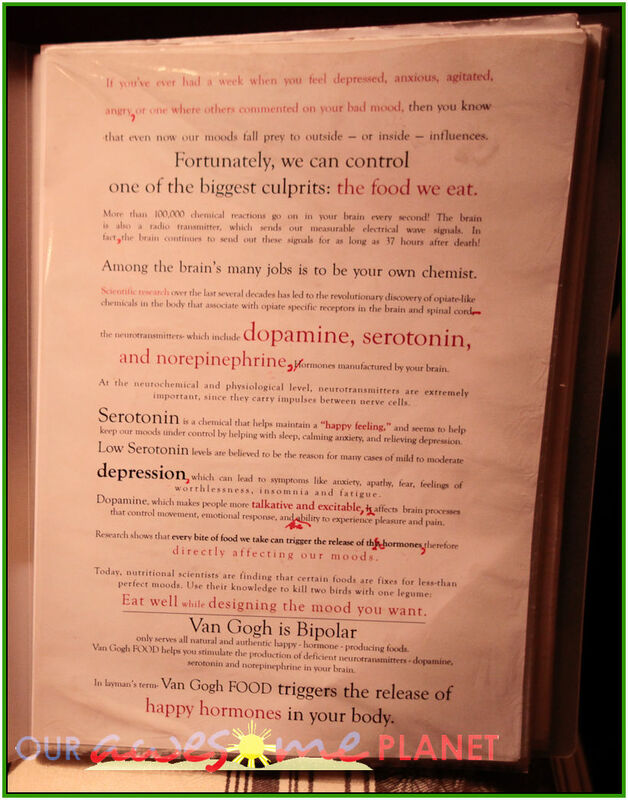 The entire premise of Van Gogh is Bipolar revolves around introducing mood-altering inspired dishes that trigger happy hormones in the body. The restaurant pays tribute to popular bipolar people by naming the food in honor of them. This is one of the interesting places to visit on the Foodie Street of Maginhawa in Sikatuna Village, Quezon City. Van Gogh is Bipolar is actually Jetro’s house by day and becomes Jetro’s restaurant at night. The welcome sign on the door kindly asks visitors to remove their shoes before entering. The place is quite small and can accommodate about 15 people inside. There are 5 separate tables, with each having its own unique charm. This is Jetro, the owner. He also runs the kitchen with two helpers. Sometimes, his friends act as special servers for the night. 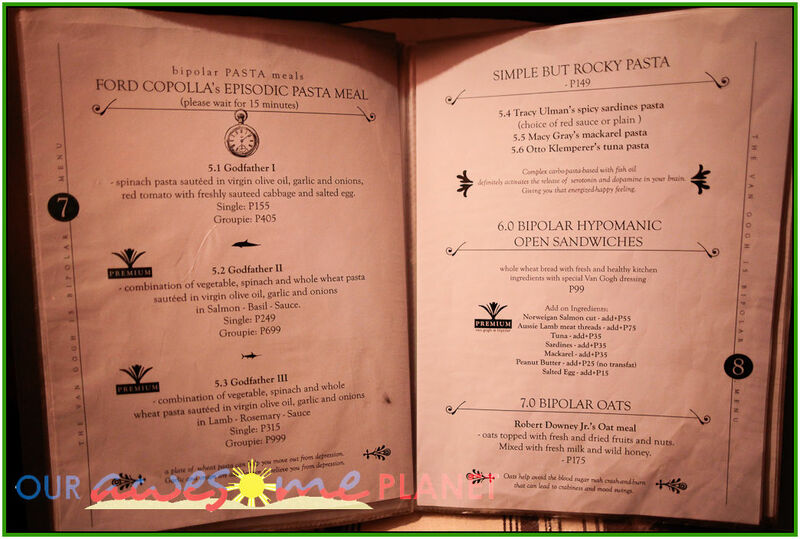 The resto operates on a self-service experience; hence, the house rules. You have to write down your own orders on pieces of paper and submit it to the kitchen. Take note that there is a waiting time of about 30 minutes before the food is served — unless you pre-order for a big group. Lemongrass or Mint with Wild Palawan Honey (P75). Axl Rose’s Egg Shot (P25 per single serving). Submerged in hot water for 5 minutes. Served in an egg shell. With honey mustard or black sauce. Larry Flynt’s Cabbage Experience (Groupie: P415). Freshly boiled whole cabbage. Served with crispy fried small fish, salted egg and fresh kitchen ingredients. Comes with the special Van Gogh black sauce. You have to wrap the ingredients inside the cabbage and dip it in a sweet black vinaigrette sauce. We loved this because of the combination of the ingredients. Plus, it’s healthy. Good for a group of 4 or more. or opt to stay in the sala area (where there are three small tables). For a bigger group (5-6 people), reserve the main dining table. Call in advance and pre-order, if possible. Godfather II (Single: P249, Groupie: P699). Combination of vegetable, spinach and whole wheat pasta sauteed in virgin olive oil, garlic and onions in Salmon – Basil – Sauce. The Salmon Belly was cooked well. The pasta was ordinary, a bit hard and served cold already. 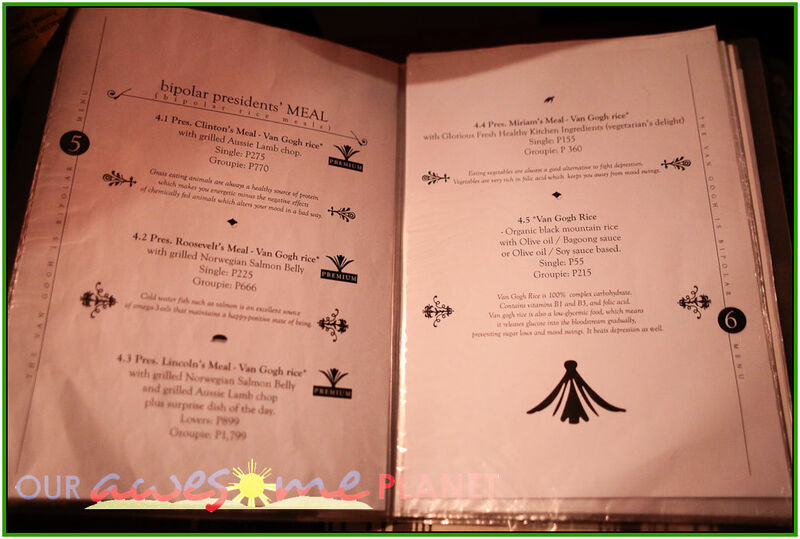 President Clinton’s Meal (Single: P275, Groupie: P770). Van Gogh Rice with drilled Aussie Lamb Chop. 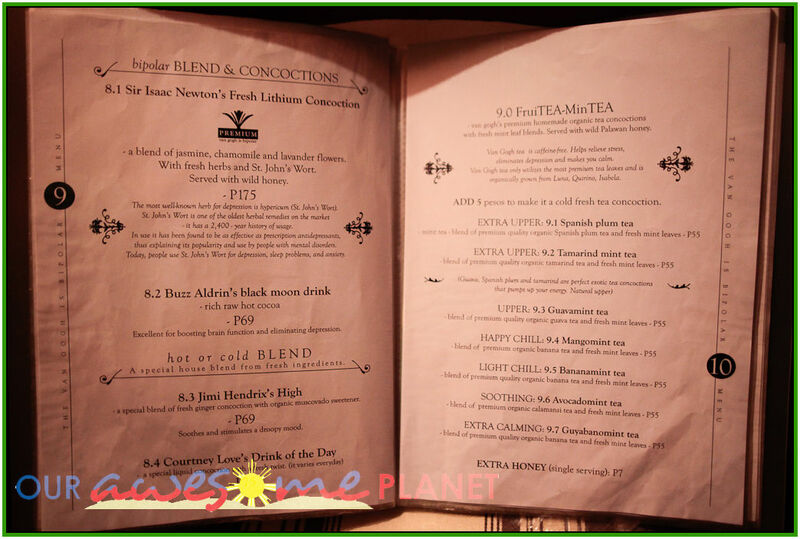 To accompany or cap the meal, you can order tea by choosing your own tea pot and your own bipolar BLEND & CONCOCTION, hot or cold BLEND. Joshua was so happy throughout the night. 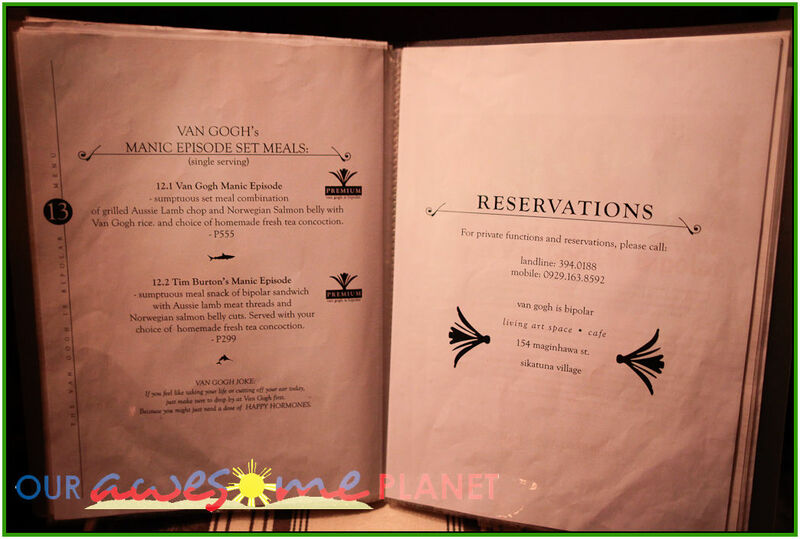 Perhaps this was the effect of the food in Van Gogh is Bipolar? BTW, don’t forget to bring the soiled dishes to the kitchen window. For anything that you need (like water, tissue or any assistance), you just have to ring the bell. For dessert, we decided to hop over to the Black Soup restaurant (of Cubao X fame) next door. Mango Turon of Black Soup Cafe. Mel Gibson’s Darkest Sin (P125 single serving). A shot of vodka with melted dark chocolate, dried walnuts and almonds with wild honey. For a party of 5 adults, we spent around P500 per head. Black Soup is located on the left and Van Gogh is Bipolar is located on the right. 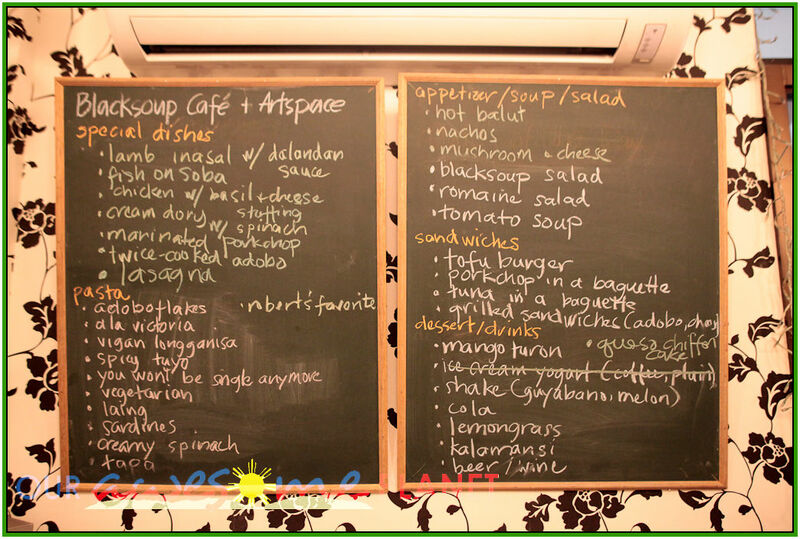 Black Soup Cafe + Artspace entrance. Van Gogh is Bipolar entrance up-close. Obviously, Van Gogh was the winner for that night. The restaurant is open everyday except on Tuesdays. Operating hours are from 5pm to 12.30am. They are open for special events and parties during lunchtime. 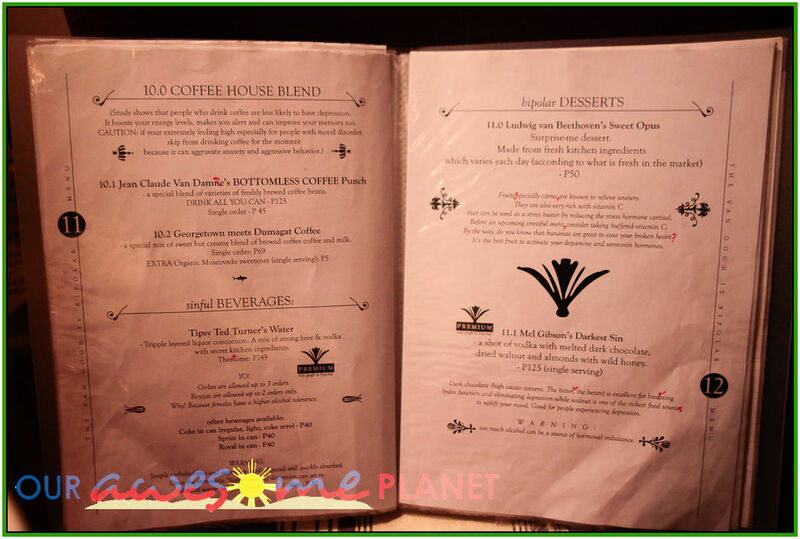 To know you’re on the right track when going to Van Gogh is Bipolar, you should see Redbucks and Marky’s along Maginhawa Street. The main landmark is the Blacksoup sign pointing to the apartment complex. the egg shot is mysterious. In Vismin, they have this drink called kinutil. hot chocolate, tuba (from coconut). most of the time taken with an egg. In my opinion, 500php per head is a bit expensive w/ the kind of service they have. Though, quirk wise, pwede na siguro i-try. This offers a different dining experience. The house/restaurant reminds me of Gayuma in Katipunan. But I hope you wrote about the food, if it’s delicious. 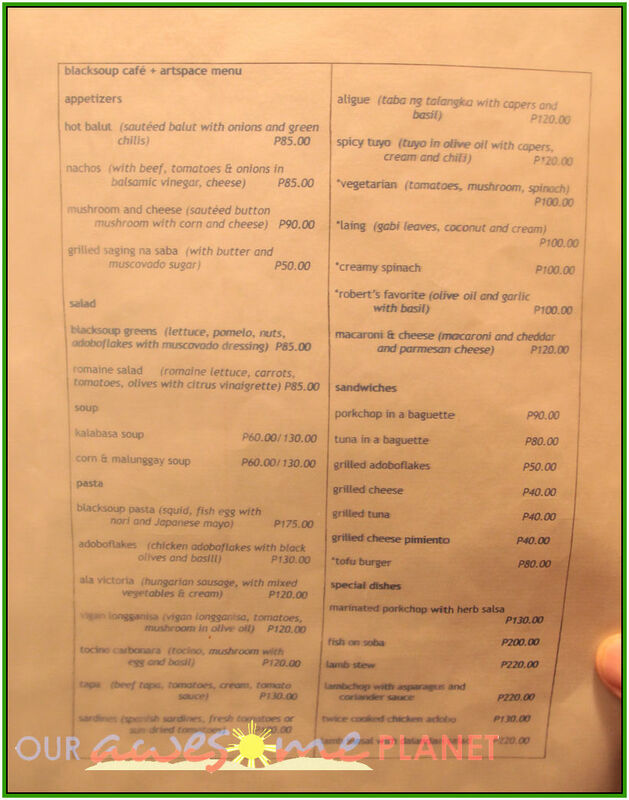 I’m wary on spending my 500 pesos for a restaurant with only few recommendations. one-man show, Jetro entertains and cook as well, so there's no focus. the experience. The food is healthy at least. Dex and I were lucky to have tried this out last year when we had the place all to ourselves. : ) The lambchop was tender and delicious (Baka ninerbiyos when they saw it was your group ordering. Hahaha!). I ordered the day’s special called “Murderer’s Meal”, which was so, so delicious — It was a combination of different kinds of tasty noodles (squid ink, whole wheat, and pancit canton) mixed with a very malinamnam and subtly sweetened sauce. Was also very impressed with the fresh pomelo juice! Never tasted pomelo juice prepared that way. I hope he gets to bring these back on the menu! Most impressive of all was Jetro, how he’s so open about being bipolar and how he overcomes this condition. Did you get to read his story creatively (both visually and writing style-wise) on the wall near the entrance? Ang galing! His concept of food benefitting one’s disposition doesn’t just apply to bipolars, but to everyone since we all experience mood swings every now and then. Akala ko si rommel ang bipolar e.. heehee! Sounds interesting… would you have any lead where can I try that Kinutil? I am very happy for Jethro. To be bi-polar is definitely daunting yet his story serve as an inspiration for others out there in the same boat. Last night, we only have 3 to choose from 🙁 We were told that everything is in a state of changing… since we felt like we didn’t want to waste our effort in getting there. 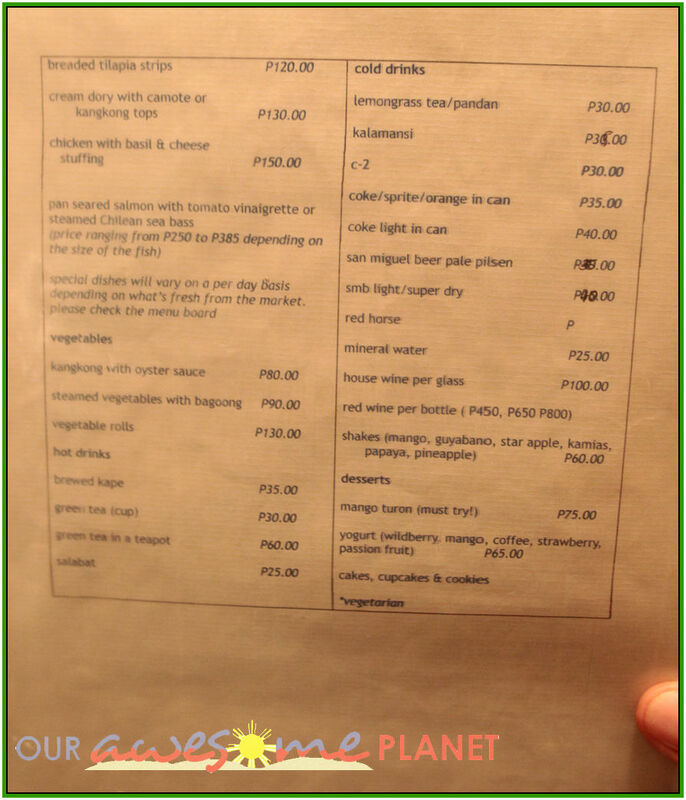 We continued with our ordering…and well, we were not disappointed naman. I don’t eat/like salmon or lamb or rice. But I have too many of ALL! Winner = Lamb! Hi there, tried to call the number for reservations sad lang no answer lagi… Ayaw ko naman na sumugod don baka in the end uwi ako luhaan kasi walang place.. I really want to try it..
not sure why they are not answering… I'll see if they have a new number. napanood ko ito sa street smart sa natgeo… i would deffinitely try this place.. by reservation lang ba dito? Kinutil is very easy to prepare. Just have a jug of fresh tuba, add a bottle of orange soft drink, add two beaten eggs, mix some condensed milk (up to you how sweet you want it to be). blend and then enjoy your kinutil! Mango Turon of Black Soup Cafe.-Yummy, but nothing special. 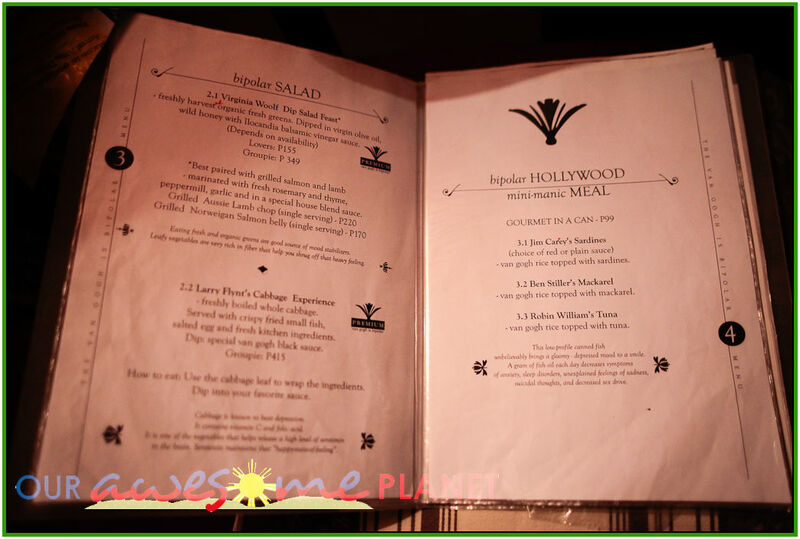 President Clinton’s Meal -The Lamb Meat was a bit tough and cooked in an amateur way. Godfather II- The pasta was ordinary, a bit hard and served cold already. I’m going here on March 30to celebrate our World Bipolar Day. 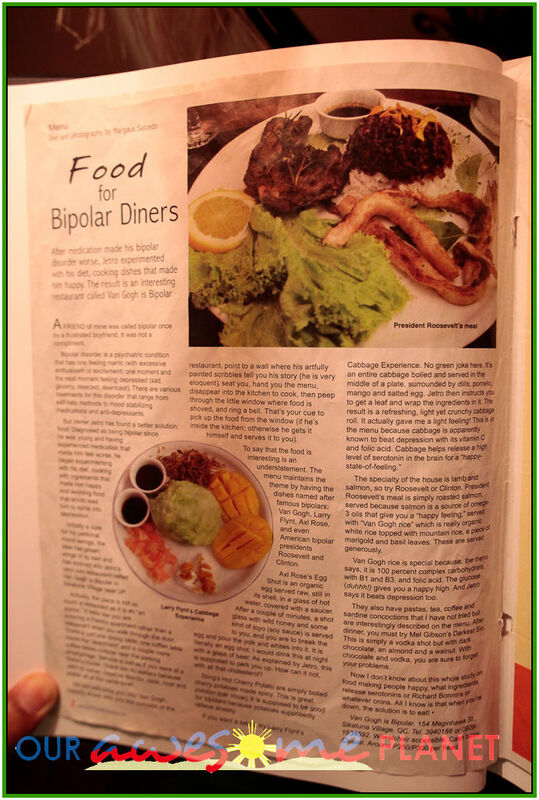 I am a bipolar as well so looking forward for very healthy treat! I’ll be with my fellow Bipolars. We are proud of Jetro.